When Dara of Cookin’ Canuck asked me to do a guest post for her blog I wanted to reciprocate the incredibly thoughtful Salmon Pierogies that she shared with all of you while I was on vacation back in March. She created them as a fusion of our two hometowns – Pittsburgh and Vancouver – and was something she thought we could eat while enjoying another of our shared passions – hockey! 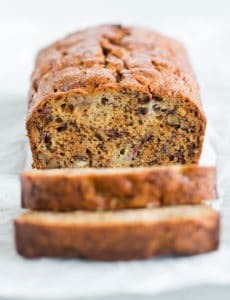 I played off of her original idea and knew immediately that this chocolate breakfast bread would be the perfect contribution as my guest post. 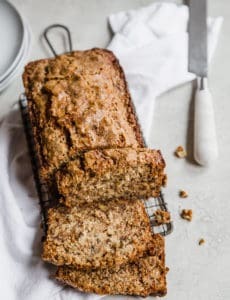 I think that this incredibly decadent, sinful breakfast treat must have good-for-your-soul magical powers that will cure whatever ails you (even if it’s only hunger!). 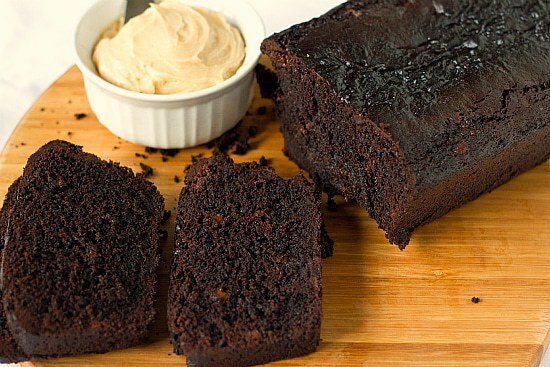 Head on over to Cookin’ Canuck to read the story behind the breakfast bread and get the recipe for Double-Chocolate Loaf with Peanut Butter Cream Cheese Spread. 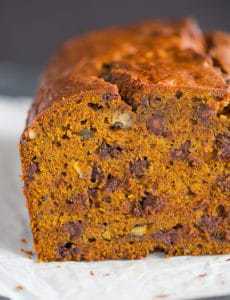 Dara has a wide array of amazing recipes on her site, so take some time to look around while you’re there! I made this loaf, but changed the topping to a peppermint glaze and sprinkled crushed candy cane over the top for Christmas. It was insanely delicious!!!! Mmm… love chocolate, love peanut butter, love them together. That bread looks so moist I want to stick my hand through the computer screen and grab a slice. Great way to enjoy that classic pb * chocolate combo! I do believe the peanut butter cream cheese spread puts it over the top!!!! Peanut butter cream cheese, huh? Very interesting and sounds like it would work well with many chocolate things. As delicious as this loaf appears on its own, I don’t know why we’d even need that cream cheese spread, but it does look incredible in its own right. Thanks! Holy Cow…. I am on my way to check this out for sure! Yummy! I’m getting hungry from all these sweet shares! oh goodness heading over now to check out the recipe. I have to have this!